Before getting started, the first piece of equipment required is a “Wet Floor” safety sign. If the spill or other cause of a wet floor is in a large restroom with multiple points of entry or doorways, more than one sign should be used. It’s also important to keep all safety signs posted in the area until the floors are thoroughly dry. 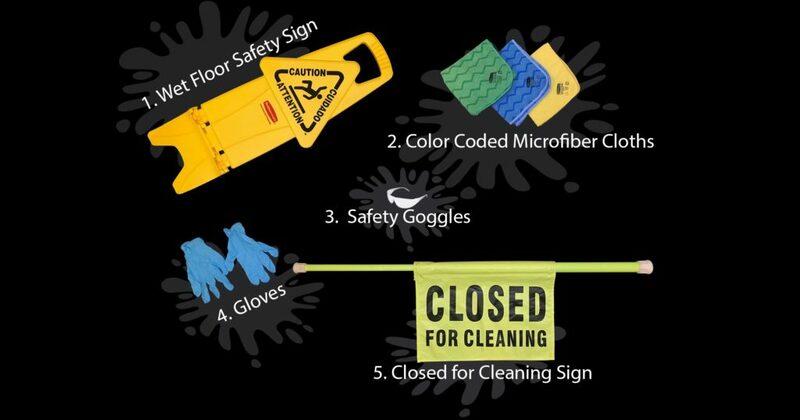 In addition to setting a wet floor safety sign on the floor, a “Closed for Cleaning” sign should be posted on the door or secured between the door frame at the entry way of the restroom. This sign will prevent patrons from entering the restroom, not just make them aware of the wet floor. 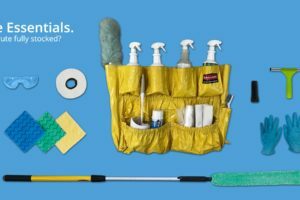 Next, personal protection equipment should be used throughout the cleaning and clean-up process. Latex gloves will protect your hands from dirt and germs and while cleaning as well as when you are removing trash or picking up debris. Safety goggles are also required to protect wearer’s eyes while spraying and wiping chemicals. Color coded cleaning cloths are also considered a safety item when used correctly to avoid cross contamination. For example, a red cloth can be used on toilets while a blue cloth is used on mirrors and green cloth is used for countertops and sinks. By using different colored cloths for different areas, you’ll be sure to keep germs from spreading to other surfaces.